The animation for this really is incredible. They have some sizing issues that need to be worked out, and the twitter option is a little finnicky but it's up and running! If the twitter option doesn't work, just keep trying. As you can see I scored District Four! I'll be interested to see how PanemOctober and TheCapitol.PN cohabitate. Gary Ross: "We could only give you a little bit because we're still down here making the movie." Completely understandable, I say. I thought they showed way more than they were going to. Really looking forward to those "hugely epic" scenes! I think it's fantastic, and it gave me goosebumps! I hope in the full trailer they release, we see more characters and locations! Over the last quarter century, MTV's Video Music Awards have provided the world with some of its most famous pop culture moments, from Britney's "comeback" performance to Kanye West crashing the stage during Taylor Swift's acceptance speech. This year, you can add "The Hunger Games" to that list of milestones. NextMovie can exclusively confirm that this year's VMAs will feature the world premiere of the first ever footage from the most anticipated film event of 2012, introduced by star Jennifer Lawrence herself. What happens when you decide to combine two popular works of fantasy together? The answer to that question is actually fairly simple. 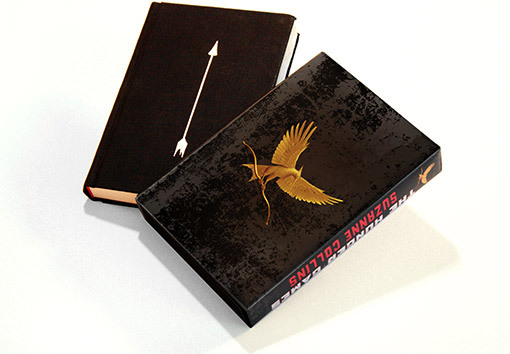 Take the Harry Potter series (written by J.K. Rowling) and add it to Suzanne Collins’ The Hunger Games trilogy and you’ll get The Potter Games! Founded by Adam Spunberg, Shylah Addante, and Sam Cushion, the games opened to the general public on July 7, 2011. 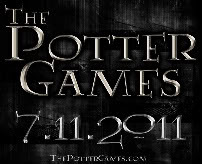 Hosted by Picktainment (a website primarily focused on encouraging “users to engage in competitions based on their picks for various awards shows”) at www.thepottergames.com, the project takes the characters from Rowling’s Harry Potter series and puts them into the world of Collins’ Hunger Games challenges. Currently, 206, 238 people have signed up to participate in the games and a Rebellion page was launched last week on August 8, 2011. Once on the homepage, users can choose between the following the tributes: Ginny Weasley, Fred Weasley, Hannah Abbott, Colin Creevey, Hermione Granger, Lavender Brown, Viktor Krum, Draco Malfoy, Pansy Parkinson, Cho Chang, Parvati Patil, Katie Bell, Fleur Delacour, George Weasley, Neville Longbottom, Cormac McLaggen, Harry Potter, Ron Weasley, Cedric Diggory, Vincent Crabbe, Padma Patil, and Gregory. While on the Rebellion site, they have to pick between Team Neville or Luna and continue to follow directions until their next task. 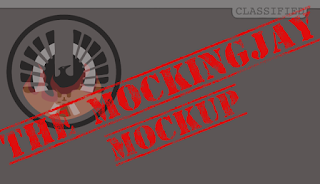 Team Luna is currently unavailable to the public, but will open sometime soon. Read the interview with Adam Spunberg here. Our very own Courtney gets a mention! The book, which will cost $30, goes on sale in November. Zoe Kravitz talks about visiting The Hunger Games set. Bonus Ezra Miller who seems like a fan! Read the article here. "It's very rewarding to play Effie. It's always rewarding to make a movie that you know is going to be entertaining, as well as really thought provoking at the same time. 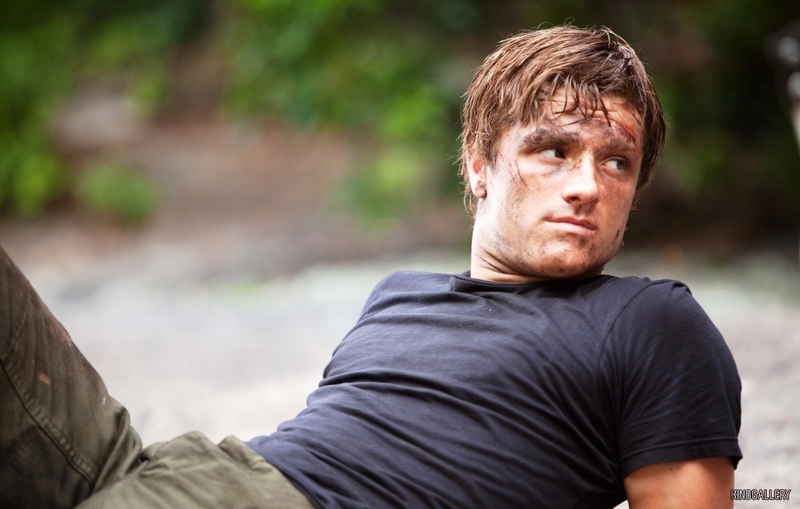 That's what's really thrilling for me as an actor, just knowing that we're putting that out there." Click here for the accompanying article. 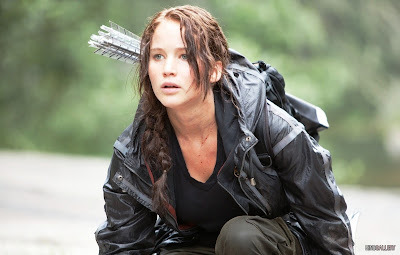 Release Date For Catching Fire: November 22nd, 2013! WOW! 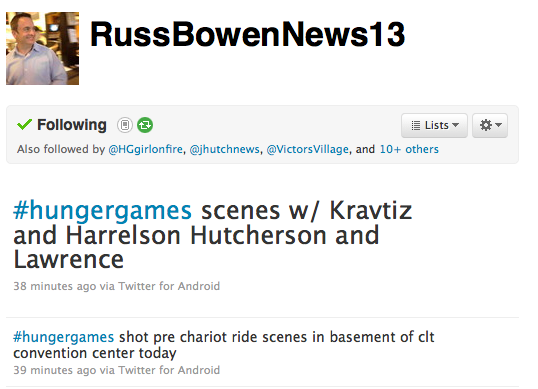 A release date for Catching Fire already! We don't know where these are originally from, but they've been found on Tumblr here. I've replaced these with high-res versions, so click to enlarge! #PanemOctober is back.......and so are the Gamemakers. 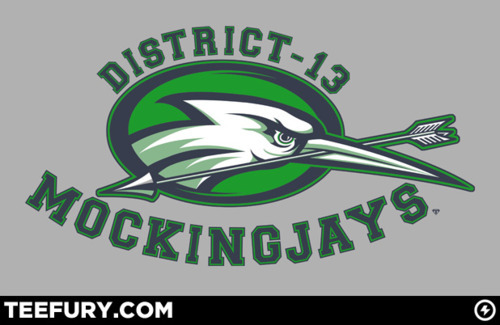 DWTC: Many of the Districts have created tumblr pages and facebook groups, and seem to be bent on Rebellion. Are you monitoring these pages? 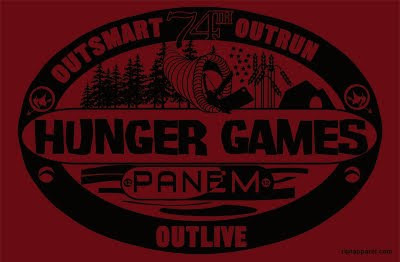 HG: The Capitol does have record of popular groups and is monitoring them very closely. A Rebellion does not seem likely, but that doesn’t stop us from watching over people like Tumblr’s FYD12 and The Capitol is Watching. They are aware of our monitoring systems, so we do not deny doing so. OOOOOO we're shaking in our boots, gamemakers. Bring it on! While this certainly comes a bit of a surprise, especially given that Soderbergh isn’t exactly sitting around doing nothing (he plans to shoot Magic Mike, The Man From U.N.C.L.E. and Liberace before the end of next year), the team-up isn’t necessarily as out of left field as one might think: Soderbergh and Ross have been good friends for a number of years, with Soderbergh producing Ross’ Pleasantville and Ross frequently giving feedback on Soderbergh’s scripts. Frankly, I'm ecstatic, both that they're doing second unit work (there is very little time to get everything done without a second crew filming) and that a director of such high caliber is doing it. Check out his IMDb page. 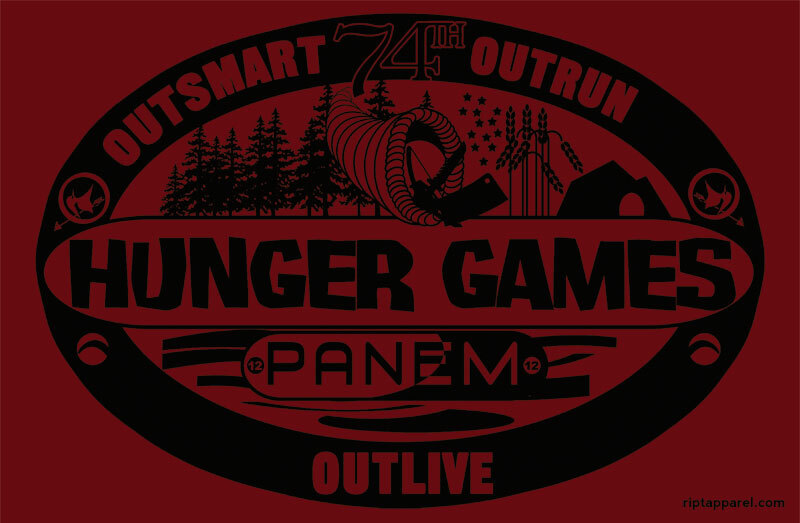 TeeFury sells it's first Hunger Games inspired shirt! TeeFury.com is a website that sells one shirt for 24 hours at $10. At around midnight Eastern time, TeeFury will be selling this tshirt! Jump on it before it's gone forever!! "In addition to their instrumental work, Universal Republic will release collections of the songs featured in the film and songs directly influenced by the themes -- freedom, rebellion, survival, family -- and subject matter of the film. Burnett, billed as executive music producer, will oversee all production and will produce many of the individual tracks being recorded by new and established artists. Music for the film is still in the planning stages and releases are expected to coincide with the film's March 23 theatrical release. The film and companion music will feature original recordings, but decision has been made on how many sets will be released." OH Score and Soundtrack!!! So unbelievably excited! 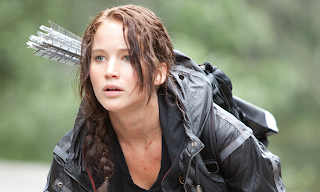 Lionsgate announces Hunger Games set visit winners! Congratulations to these fine people! I'm really glad to see that they extended the contest to other countries! 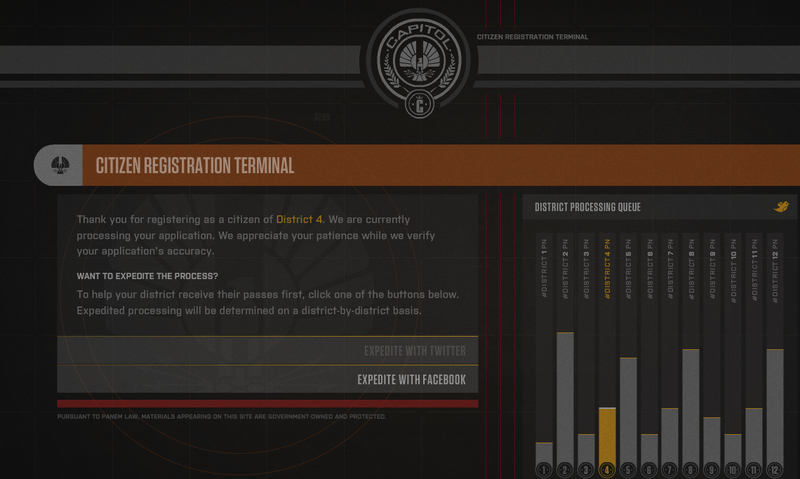 Also, check out the new "fan hub" on the Hunger Games official Facebook page! The wait is over! PanemOctober is back. And with a snazzy new layout! 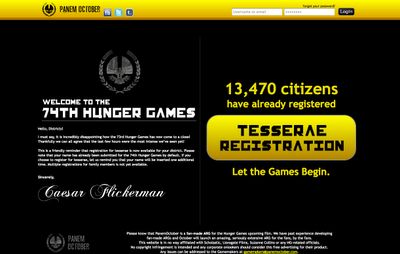 If you had previously signed up for tesserae, expect an email from the Panem Gamemakers with instructions on logging in to the new site and changing your password. If you haven't signed up for tesserae, registration is now open again! I'm excited, anxious, and yearning to see how they present this in moving pictures. I just cannot wait to see it.